Salt Lake City (originally known as "Great Salt Lake City", but today often called by its initials, S.L.C.) is the state capital and most populous city of Utah. As of the 2000 census, its population was 181,743, however the population of the Salt Lake City metropolitan area is comfortably over a million - and that is incorporate within a still larger metropolitan area which also encompasses Ogden-Clearfield and has a combined population of well over two million. The city was originally founded in 1847 by Mormon pioneers led by Brigham Young, who first reached Salt Lake Valley on July 24th, 1847. Today, it still contains the world headquarters of the Church of Jesus Christ of the Latter-day Saints ("LDS" or "Mormons"). Probably the most famous educational institution in Salt Lake City is the University of Utah. The University of Utah is a public research university that was originally founded in 1850. Professional sports teams in Salt Lake City include the baseball team, the Salt Lake Bees, the basketball team, the Utah Jazz, and the soccer team, Real Salt Lake. 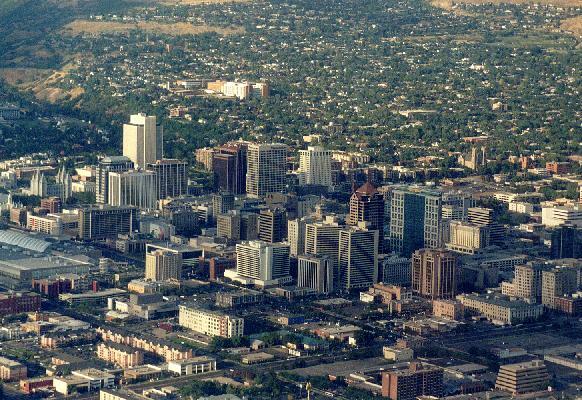 Salt Lake City's nicknames include "City of the Saints" and "Crossroads of the West".